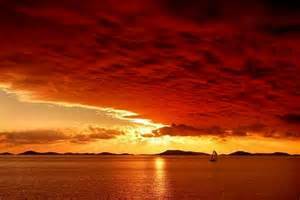 “Red sky at night, sailor’s delight. Red sky in morning, sailor’s warning”, is an old saying I pondered on today while commuting to work with a red sky glaring at Dean and I this morning. And the weathermen are reporting a snow storm once again for this weekend. Now I can focus on that gloomy forecast, or I can dream about the future tense, be sailing on a lake with my hubby as my matey. Of course, sipping on pina coladas, a comfortable 80 degrees, sunny, and the red sky in the evening!